I’ve finally settled in to the fiber I’m working with now, the merino-silk blend that I wrote about before. I’m keeping it pretty well at the diameter I want, and I’m accustomed once again to how it handles. I finished the first two bobbins last week, and plied them. I was really hoping that the colors would match the merino-silk fiber I did last summer, as I want to knit this up as a sweater. It’s really hard to tell until you have a plied result to compare. So – do they match? The new fiber has spun up darker and closer to a solid color than the other fiber. The good news is that they are in the same color family, and will look good knitted together in stripes. Especially if I use half-linen stitch, which blurs color changes and I think will be really lovely. I’ll swatch it to see. 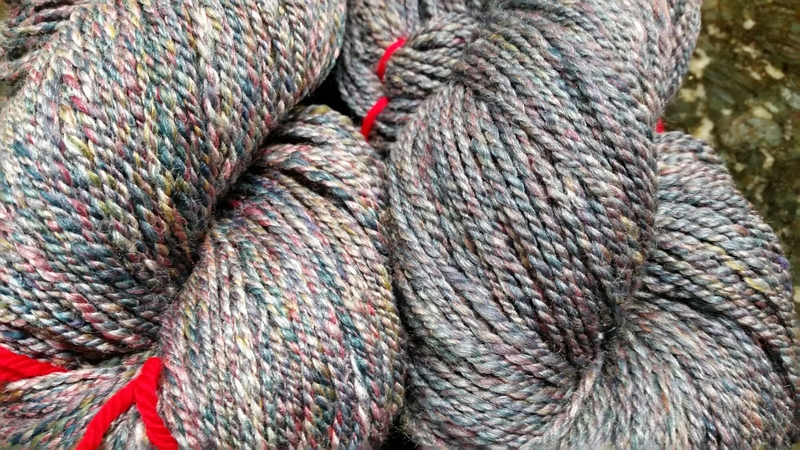 Today’s picture shows skeins of the old (left) & new (right) together. This entry was posted in Art, Fiber and tagged Life on life's terms, Merino-silk Blend, Spinning. Bookmark the permalink.